American cut glass is a uniquely American art form, reaching its height in the period between the Philadelphia Centennial of 1876 and the beginning of the First World War (1914). Cut glass, also sometimes called “crystal,” is made with lead oxide to give the glass its brilliant clarity and refractiveness, softness for cutting, and ringing, bell-like tone. 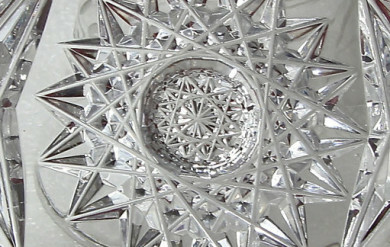 American glassmakers perfected the curved cut, and as had European glassmakers before them, cut, engraved, acid-etched and decorated the efflorescence of American cut glass for the American home. American Brilliant Cut and Engraved Glass, An American Art Form (c. 1876-1914), from a private collection located here in Houston, showcases the entire range of American cut glass – from large, impressive punchbowls and vases to small, delicate engraved stemware, with the glass both brilliantly clear and delicately colored. Not only does the glass show the technical and creative artistry of American industry of over one hundred years ago, but through the exhibition viewers will also learn more about Americans at home and their lifestyles during the late 19th and early 20th centuries.